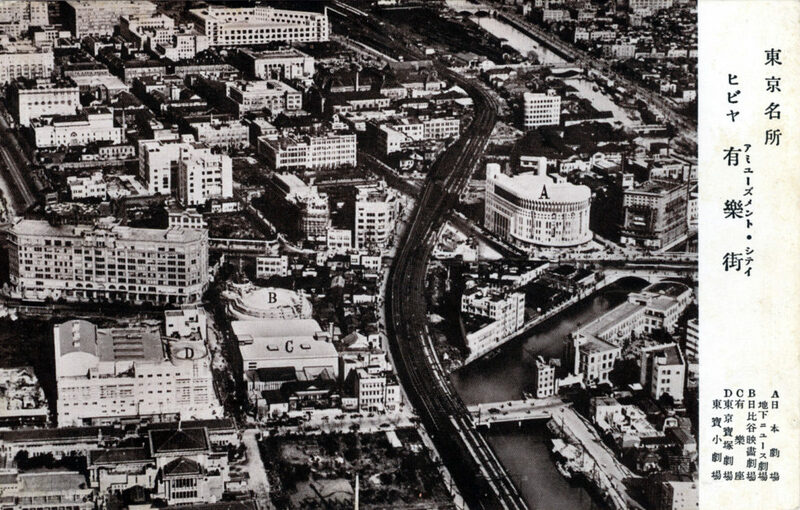 Aerial View of Yurakucho Theaters, c. 1935. Aerial view of Yurakucho “Amusement City”, c. 1935. Tokyo Central Station can be partially seen at top-center; Yurakucho Station is at center. In 1933, three high-class theaters of several thousand seats were built in Tokyo’s Yurakucho district, within easy walking-distance of the station, by property magnate Kobayashi Ichizo, who had made his money developing the Osaka-Kobe railway and organizing the all-girl Takarazuka Revue at Takarazuka, Japan. In the image above, the three new theaters were clustered together near the Imperial Hotel (partially visible at lower-left), including the Hibiya Eiga Gekijo (B), Yurakuza Theater (C), and the Toho (aka Takarazuka) Gekijo (D) within easy walking distance of Yurakucho Station near the 4000-seat Nichigeki Theater (A). The place name, Yurakucho (‘Quarter pleasure can be had’), dating from the Meiji period, arises from an altered pronunciation of Urakusai. Oda Urakusai was the brother of Tokugawa Iyeyasu’s military commander and was first to settle in the area near present-day Sukiyabashi, constructing his residence and teahouse along Sotobori moat in the 17th century. The moat can still been seen in the c. 1935 postcard image above.